Estimated unimpeded taxi times can be used to quantify a flight’s taxiing delay when compared with its actual taxi time. Currently, flight unimpeded taxi times are calculated by the Federal Aviation Administration using a regression method where flights in the Aviation System Performance Metrics data (ASPM) are clustered on the season of operation, airline, airport, and calendar year. The method utilizes the airline-reported gate-Out, wheels-Off, wheels-On, gate-In (OOOI) times rounded to the nearest minute. For non-reporting airlines, these OOOI times are estimated from similar flights. The purpose of this study is to evaluate the unimpeded time using a surveillance-based approach by identifying the time a flight spent waiting in the system (i.e., traveling slower than a defined speed threshold) and comparing it to the total taxi time. This study focuses on analyzing both arrivals and departures for six U.S. airports (ATL, CLT, DEN, IAH, JFK, and ORD) during the month of July 2015. Airport Surface Detection Equipment-Model X surveillance data are matched with ASPM data to have complete coverage of the taxiing phase of airplanes between the gate and runway for taxi out and in procedures. The study results show the benefits of using surveillance information for surface performance, as spatial analyses allow for quick identification of taxiway locations that were the most susceptible to delays. Additionally, this study also evaluates changes in the unimpeded metric when compared to the current regression method and the 5th-to-15th clustering method described in current literature. Team: Virginia Tech. PI: Susan Hotle. CoPI: Antonio Trani; Researcher: Navid Mirmohammadsadeghi. There is currently a need for the FAA to develop a better understanding of the operational strategies and cost structures for commercial space operators in the U.S. National Airspace System (NAS). Commercial space launches in the U.S. are expected to more than double in the coming decade, requiring the FAA to make an increasing number of decisions each year on how to best share the NAS between air traffic and commercial space operators. The goal when making these decisions is to find an equitable balance between air traffic and commercial launch operations, and to then implement actions that are Pareto improvements, that is, when one NAS operator becomes better off without the other operator becoming worse off. Ultimately, finding this equitable balance and, therein implementing Pareto operational strategies, depends on cost and financial information for both commercial airlines and commercial space companies. Such information is available for commercial airlines; however, no cost and financial data exists for commercial space companies. 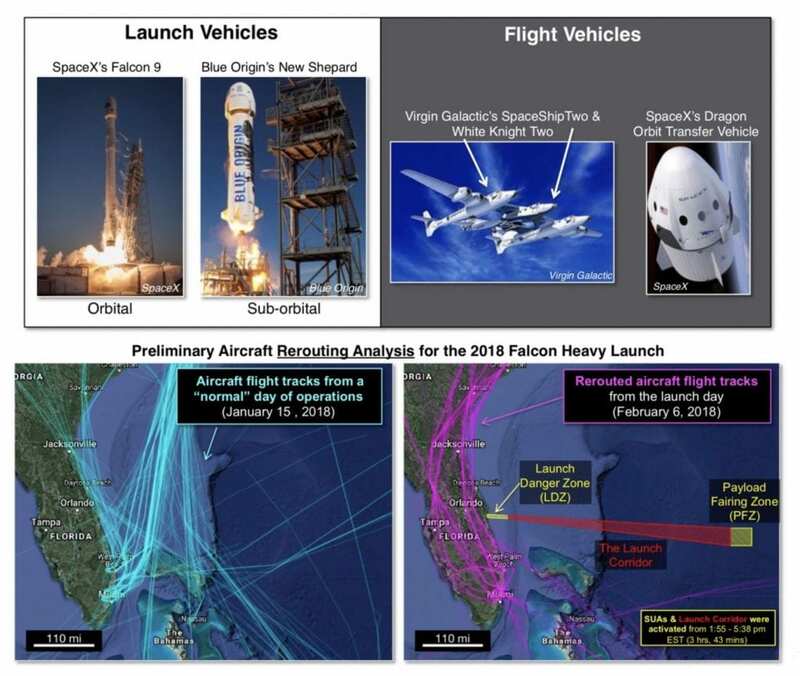 The corresponding objective of this project is to develop a cost model that will quantify commercial space costs, specifically, the cost of new commercial launch & flight vehicles, their payloads, their operations, and their reentry and recovery operations. In addition, the model estimates the cost of launch delays to commercial launch vehicle providers. Team: Massachusetts Institute of Technology. PI: John Hansman. Researcher: Greg O’Neill. A key component of the goals of the Next Generation Air Transportation System (NextGen) is to safely improve the efficiency of the National Airspace System (NAS) by enhancing efficiency in metroplexes. Based on the use of precise satellite-based navigation, Time Based Flow Management (TBFM), and other advanced techniques and tools, the benefits of a metroplex have been identified through research, indicating that it is capable of making airspace more efficient with less queueing delay and more throughput. However, those studies focused only on operations in normal weather conditions; special weather conditions such as convection were not considered. This study investigated the quantitative impacts of a metroplex under representative operation conditions in convection. Investigations included identification of representative convective weather conditions, analysis of historical radar tracking data in a post-metroplex period, development of queuing system-based models of Terminal Radar Approach Control (TRACON) facility arrival operations with and without metroplex for the North Texas Metroplex, and simulations to evaluate airspace performance in terms of TRACON throughput and arriving delays. 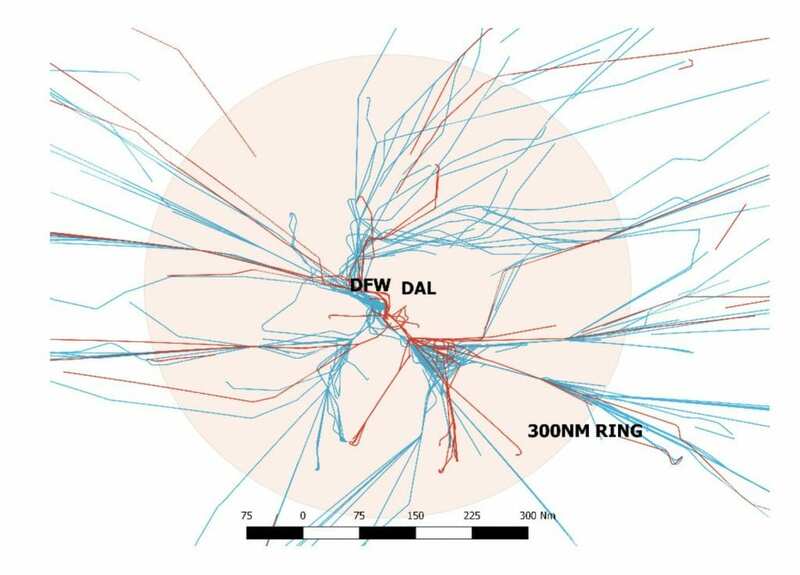 Simulation analyses showed an average 16.7% increase in Dallas/Fort Worth International (DFW) arrival throughput with peak demand of 15 minutes, with 1.65 minutes saved per arrival flight at DFW and 0.38 minutes saved per arrival flight at Dallas Love Field (DAL) when a metroplex is implemented. Furthermore, given enough airport capacity, metroplex is able to utilize more airport capacity, have more airport arrival throughput, and save more arrival time as arrival demand increases. The Unmanned Aerial Vehicle (UAV) density in metropolitan areas is expected to increase in the near future due to the use of UAVs to replace labor-intensive jobs, like package delivery. Studies estimate that eighty-eight billion small UAVs will operate under 500 feet in Washington DC metropolitan area in 2050 with trillions of dollars of societal economic benefit. However, in metropolitan areas, many obstacles, like skyscrapers, blocks signals from radar systems to monitor status of UAVs. Equipping distributed radar systems or great numbers of receivers to collect broadcasted-flight data in a city is costly in early developing stages of UAV services. Hence, a communication framework that economically monitor UAVs, while ensuring safety and security of the operations, in metropolitan areas is crucial to facilitate the adoption of the large-scale UAV services. This research project proposes a blockchain-inspired data transmission mechanism, Traffic Information Exchange Network (TIEN), to enable the drone-to-drone communication amidst obstacles in a secured and robust manner. The goal of this project is to provide traffic information services for flying drones, operators, and governmental sectors to be aware of traffic status in any place. TIEN system consists of three components, which are onboard systems, ground systems, and a data center. Onboard systems are equipped on UAVs and transmit/receive UAV flight status with other onboard systems or ground systems. Ground systems are deployed across any region and receive/relay flight information from/to onboard systems and data centers. Data centers receive the traffic information from ground systems via Internet and share this information with governmental sectors or UAV operators. TIEN system uses mechanisms from the blockchain technology to ensure data transmission security and communication robustness. Team: Purdue University. PI: Daniel A. DeLaurentis. Researchers: Hsun Chao, Apoorv Maheshwari, Varun Sudarsanan and Shashank Tamaskar. Recent activities in electric propulsion and autonomy provide opportunity to improve regional air mobility in general. This effort focused on Midwest as a candidate region for inter-city, intra-city and “airport shuttle” services via on-demand air taxi operations. The study incorporates multiple conventional take-off landing aircraft and proposed vertical take-off landing aircraft, powered by either conventional fuels or electricity as the aircraft model choice for an air taxi service. In this project, a computational analysis framework to assess the impact of technology advancement in electric propulsion and autonomy on the future of regional air transportation system, is developed. The analysis framework helps compare existing modes of transportation, such as automobile and commercial airline service, with the new “on-demand air taxi” mode of transportation service using an effective-cost metric that combines both trip cost and time information. It also provides an estimate of how many individuals, based on their income and value of travel time, could potentially afford this new mode of transportation that includes autonomy and electric propulsion technology while operating from small regional airports. The framework is also developed in two variants — a specific trip model and a generic trip model. The specific trip approach leverages Google Map and Rome2Rio APIs for driving and flight information respectively, while the generic approach uses curve-fit/approximate models for rapid calculations of trip time and cost for various system-level market analysis. Team: Purdue University. PIs: William A. Crossley, Daniel A. DeLaurentis. Researchers: Satadru Roy, Apoorv Maheshwari. In this project, we investigated the process and results for measuring the air connectivity of the US air transportation network (ATN). Researchers at the World Bank developed the original Air Connectivity Index (ACI) to measure the connectivity of the global air transport network. The Purdue work demonstrated that the ACI is also applicable to the US ATN, capturing the relevant aspects of connectivity and correlating with econometric variables, but also presenting new challenges for correct implementation. We determined how to adapt the World Bank’s original methodology to suit the US ATN. 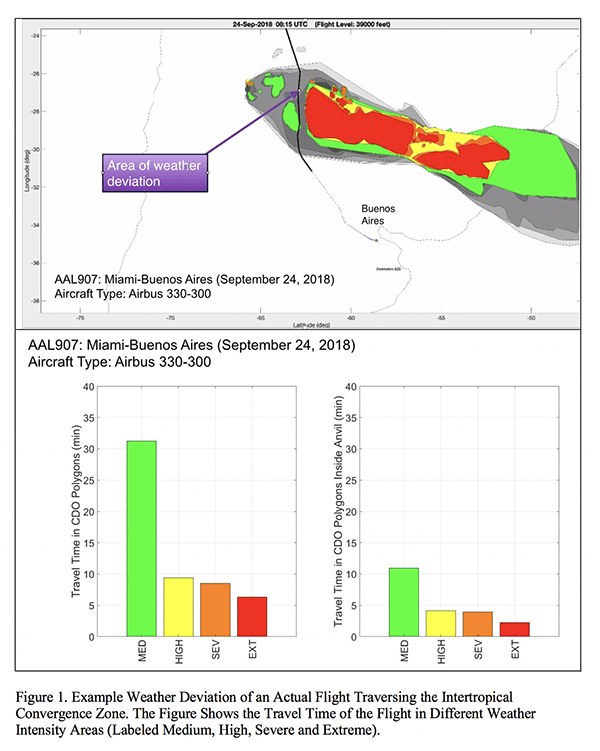 We applied the ACI at different levels of granularity (state, metropolitan, and airport) and conducted time series of the ACI at the metropolitan and airport level. We developed statistical models to predict ACI at the airport and metropolitan levels using facility and econometric variables. We investigated what the results revealed about the US ATN and how the index can be used by policymakers. Team: Purdue University. PI: Daniel A. DeLaurentis. Researchers: Lauren Bowers, Linas Mockus, Shashank Tamaskar. Documentation: Investigation of Connectivity: Definition, Application, and Formulation (AIAA 2015-3183), 15th AIAA Aviation Technology, Integration, and Operations Conference, 2015. Top: Two anomaly indicator scores colored by the final score. Middle: The sinusoid and spectrogram of sample voice signal. Bottom: A JFK go-around flight with high overtake risk arriving on 22L. The ongoing and planned implementation of autonomous NextGen technologies creates a risk of the National Airspace System (NAS) safety and efficiency degradation caused by unintended behaviors that can result from human-automation or automation-automation interactions. In order to maintain and enhance current levels of NAS safety and efficiency, it is important to detect such anomalous behaviors and sequences of precursor states that may lead to accidents with high probability. However, the increasingly large body of data about NAS operations, which hold the keys to the problem of detecting anomalies, is not fully utilized. With a focus on arrival operations to JFK airport, four-dimensional flight trajectory data, final approach report information, weather conditions, and Air Traffic Control (ATC) voice recordings have been mined and incorporated as features in the anomaly detection using machine learning algorithms. Aided with Subject Matter Experts (SMEs) consultations, the operational significance of the detected anomalies is examined, thus extending the design of the anomaly detection system. The output of this algorithm-driven data-discovery approach is a single score composed of 8 anomaly indicator scores for each flight. To take a deeper look into determining precursors to anomaly events, speaker recognition and audio channel occupancy analysis are employed to the ATC voice recordings. Detection and causal analysis of go-around flights are also developed to provide insights into the accident precursor analysis. The research efforts can be given to stakeholders and systems to take the necessary mitigating actions in advance to prevent the safety or efficiency degradations. Team: University of California, Berkeley (UCB), Aviation Analysis Experts (ATAC), Metron Scientific Solutions (METRON). PI: Mark Hansen (UCB), John Schade (ATAC). Researchers: Lu Dai (UCB), Yulin Liu (UCB), Kennis Chan (ATAC), Greg Godfrey, Sean Daugherty, Brian Bender (all METRON). To enable safe and efficient UAS operations at lower altitudes, it is necessary to conduct airspace management and operations in urban airspace for a medium to large scale UAS traffic. A risk-based approach is to be adopted in traffic routing and scheduling, which should account for airspace restrictions, flight risk and safety constraints. This study includes deterministic and stochastic clustering-based single drone routing, and multiple drone routing and scheduling under single or multiple operators. The current stage of this study focuses on deterministic clustering-based single drone routing, which gives the optimal path in low urban airspace. Wind or any other features that cause uncertainties are not considered in this stage. San Francisco area was studied in this research. The geospatial complexity derived from geometric variability of existing static obstacles such as buildings and terrain poses a challenge in the UAS traffic flow management. The shortest path problem for drone is simplified to a 2D problem that we solve at several candidate altitudes. Altitude candidates were generated by clustering fixed obstacles in urban airspace, mainly buildings. Fast marching algorithm is chosen to generate the shortest paths at each altitude candidate. The optimal altitude will then be determined by weighing the vertical cost to ascend to certain altitude and the horizontal travel cost of the shortest path at that altitude. 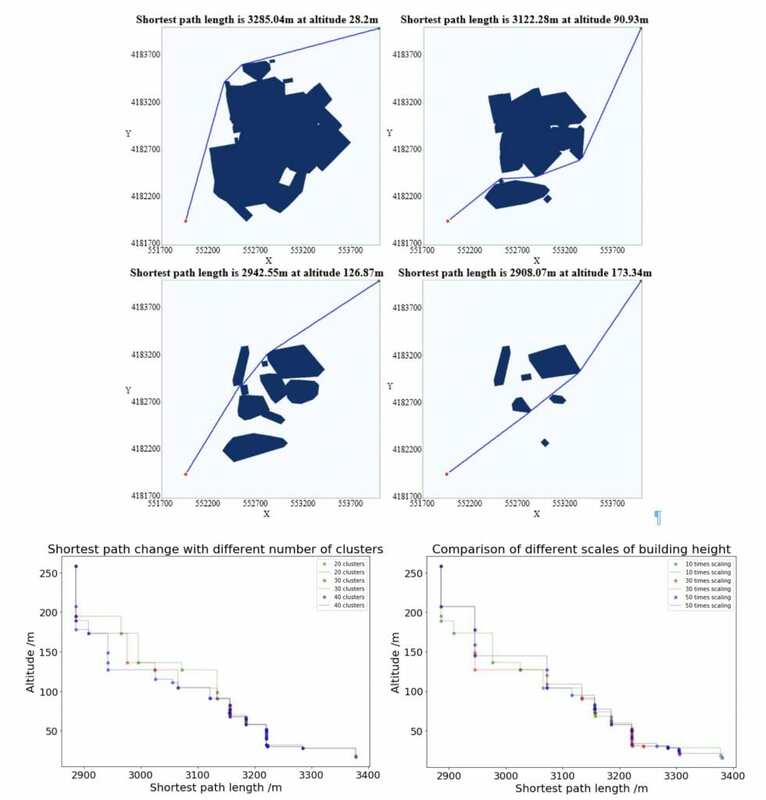 Sensitivity analysis is performed with different numbers of obstacle clusters and with different weights given to altitude in the clustering procedure. Different path planning algorithms are also compared. Team: University of California, Berkeley (UCB), Korea Advanced Institute of Science and Technology (KAIST). PI: Mark Hansen (UCB); CoPIs: Yoonjin Yoon (KAIST); Researchers: Ang Li (UCB). This research addresses the Federal Aviation Administration’s (FAA) need to further develop a Business Case to support LPGBS changes and therefore protect NAS infrastructure from lightning strikes and convective weather. In the previous phases of this work, analyses were based on the National Lightning Detection Network (NLDN) data and outage reports of the FAA gathered between 1999 and 2005. The current work uses the updated NLDN and Logistics databases (i.e., data gathered beyond 2006) and further explores: (1) the impact of lightning strikes on NAS equipment outages, (2) correlation of strokes and outages with any other type of Systems upsets, (3) impact of lightning-induced outages and other types of convective-weather-induced outages on NAS performance in terms of throughput, and (4) if the cost and number of parts for equipment that need repairs due to lightning strikes are proportionally balanced with the number of reported outages. The research also explores if there are any statistically significant differences between the baseline case results (1999-2005), and the updated results (2006-2013). A refined NAS Impact Risk Model for FAA Infrastructure Investments is also proposed with the objective to provide sound investment decisions for the NAS equipment (regarding the lightning strikes). The investment decisions are based on (i) the extent the outages have on the NAS performance, (ii) the type, importance and role of airport/equipment with the local region, TRACON or ARTCC, and (iii) the type of traffic served. In order to perform such analyses additional information are used on FAA investments into facilities and FAA databases such as Aviation System Performance Metrics (ASPM), and Operations Network (OPSNET). In Phases 1 and 2 of this project (under NEXTOR 1), we developed models to quantify wake vortex potential encounters and studied new concepts of operations where wake vortices could be a limiting factor to airport and airspace capacity. Phase 3 of this project is developing mature wake vortex analysis tools to allow FAA and its contractors to study potential implications of wakes in future concepts of operations in the NAS. Specifically, Virginia Tech has developed an Enhanced Wake Encounter Model (EWEM) to predict potential wake encounters under existing operations and future scenarios. The EWEM model is going through a series of refinements in Phase 3 to account for wind conditions and more realistic wake envelopes developed with the most recent NASA APA suite of models. Both GMU and Virginia Tech models will be merged into a toolset that can be distributed to various FAA organizations and contractors (like CSSI) to perform analyses of future NextGen airport operational scenarios. This model will be used by NASA and FAA to include wake vortex a as an airport and airspace constraint. Team: Virginia Tech, Massachusetts Institute of Technology and George Mason University. Team: Ohio State University: Philip J. Smith, Amy Spencer and Mark Evans. 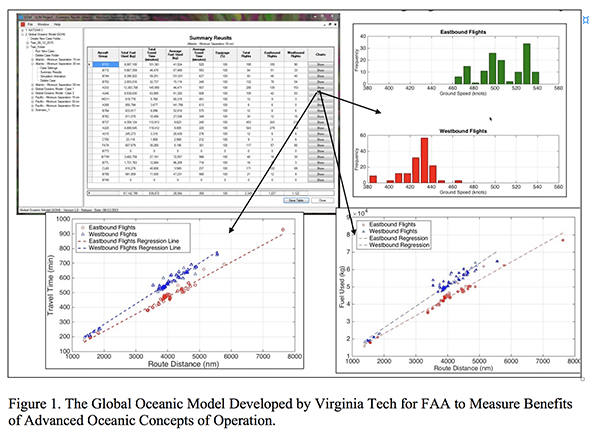 Virginia Tech previously developed a simulation tool called GO (Global Oceanic Model) for the FAA (see Figure 1). GOM quantifies fuel, travel time, and level of service benefits for oceanic operations. The FAA has relied on the results obtained with GO to provide inputs to various ICAO North Atlantic working groups. Recently FAA has used GO as the primary means of estimating operator benefits of reduced oceanic separation in U.S. airspace for the ongoing Advanced Surveillance Enhanced Procedural Separation (ASEPS) investment analysis. Under previous NEXTOR II work, Virginia Tech expanded the scope and increased the functionality of this model. This project further enhanced the GO model to continue to support the ongoing investment analysis for ASEPS. 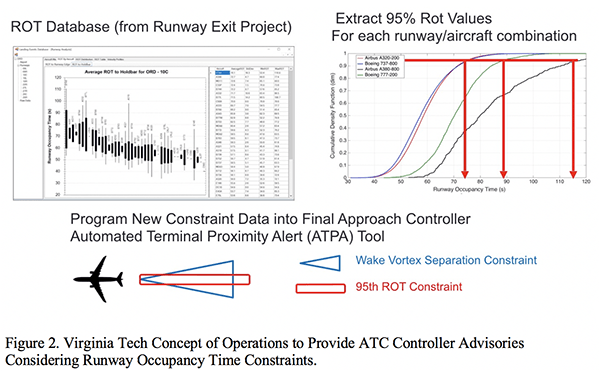 Virginia Tech improved the dynamics of pilot/ATC controller climb requests in the GO model, the blocked climb requests and improvements to the aircraft performance model. 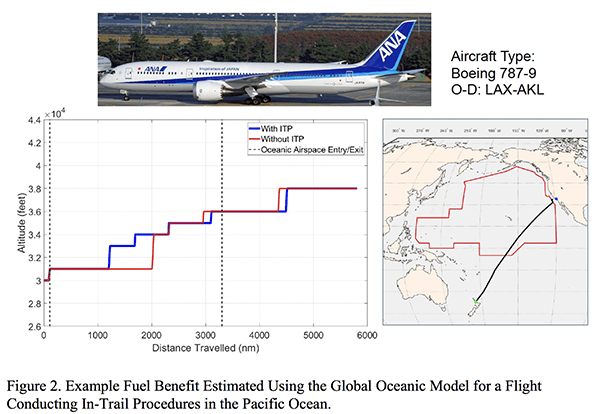 The improvements to the GO model relied on 42 days of historical Advanced Technologies & Oceanic Procedures (ATOP) data to validate the Global Oceanic Model aircraft climb request logic. The model also was programmed to include In-Trail Climb/Descent Procedures (ITP) using ADS-B and ADS-C technology (see Figure 2). Team: Virginia Tech. Antonio Trani, Nicolas Hinze, Arman Izadi, Yanqi Liang, Tao Li, Thomas Spencer, Nikolaos Tsikas, Yang Zhang, Aswin Gunnam. Virginia Tech is helping FAA to develop a methodology to quantify operational and safety benefits associated with the provision of meteorological (MET) information to aircraft operating in non-controlled, oceanic airspace. The benefits include safety (e.g. flight crew workload, cabin management) and oceanic flight efficiency (e.g. flight routing, airspace management, and cockpit ATC communications). 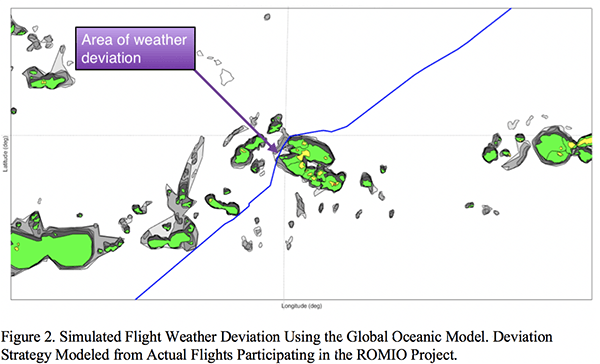 The benefit analysis includes a pilot and dispatcher survey to measure pilot and airline dispatch responses to using the ROMIO products (i.e., weather displays in the flight deck developed by the FAA) and modeling flight deviations from weather using a fast-time simulation model (Called the Global Oceanic Model) developed by Virginia Tech for the FAA. This project is a coordinated effort with the National Center for Atmospheric Research (NCAR) and three US airlines. Team: Virginia Tech. Antonio Trani. In Phases 1 and 2 of the project (under NEXTOR 1), we developed models to quantify wake vortex potential encounters and studied new concepts of operations where wake vortices could be a limiting factor to airport and airspace capacity. Phase 3 of this project is developing mature wake vortex analysis tools to allow FAA and its contractors to study potential implications of wakes in future concepts of operations in the NAS. This model could be used by NASA and FAA to include wake vortex a as an airport and airspace constraint. The U.S. Federal Aviation Administration (FAA) is responsible for maintaining a safe and efficient aerospace system. The FAA promulgates regulations that address air carriers and operators; pilots and flight and ground instructors; and commercial space transportation. The FAA has also pioneered an approach to safety management and oversight, relying on risk-based decision-making, safety management system practices, voluntary disclosures, and the use of industry performance standards as principles. New types of aviation activity within the National Airspace System (NAS) drive the need to become more strategic in how the agency approaches policy development. These new activities include unmanned aircraft systems and novel types and increasing volumes of commercial space transportation ventures. An important tool for the agency to consider when evaluating policy alternatives is the use of risk analysis informed by the elicitation of expert judgment where practical given information and data uncertainties. The benefit of using such techniques is to inform decision makers with predictive analysis of policy options involving limited safety and industry data. The FAA has developed a tool called the Integrated Safety Assessment Model (ISAM), which uses event sequence diagrams (ESDs) and fault trees to assess the impact of changes to major carrier operations and the NAS. The structure of such a model may prove useful in facilitating and informing the use of expert judgment when determining which policy choices would maximize the agency’s objectives. The FAA believes that a more formal, standardized process for the elicitation of professional judgment is important to ensure transparency and objectivity of its use in risk analysis. This report describes guidance for the elicitation of expert judgment at FAA based on risk modeling and use of expert judgment and expert elicitation methods. The report also outlines a formal, standardized process for eliciting expert judgment at FAA. Team: George Mason University; IEC. Lance Sherry, John Shortle. The Integrated Safety Assessment Model (ISAM) is a holistic model of air transportation risk in the national airspace system. The model provides a baseline estimate of risk and can be used to assess future risk based on proposed changes to the air transportation system. 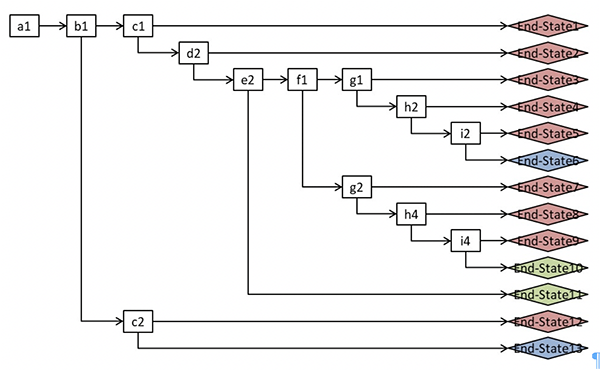 The safety model is formulated as a set of event sequence diagrams (see figure) and supporting fault trees. Fortunately, incidents and accidents are rare. However, this creates a challenge in that the number of observed events to quantify the event trees may be small. In particular, some event sequences have never occurred. But that does not mean that they could never occur in the future. The limited number of observed events implies that there can be relatively large uncertainty ranges for some of the parameters in the model. Objectives of this research are to quantify uncertainty in ISAM model parameters and to determine which parameters are most critical to the overall model output. This provides some indication of parameters that are most critical for further efforts in either data collection, modeling, or expert elicitation. This research also seeks to identify statistically significant trends from rare-event data to identify any potential underlying changes in system risk. Finally, since dependency between bottom-level events in the underlying fault trees may cause significant impacts on risk quantification, this research seeks to model the effects of common cause failures. Team: George Mason University (GMU). PI: John Shortle (GMU). Researcher: Seungwon Noh (GMU). View completed research projects here. View presentations from NEXTOR conferences, symposia and workshops here. View NEXTOR research papers here.